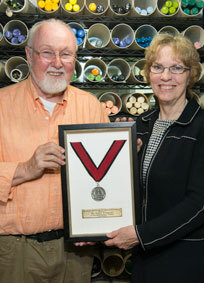 Paul Stankard, internationally respected glass artist, was recently honored to be the recipient of Muskingum University’s President’s Medal in recognition of exemplary actions on behalf of others, distinguishing himself through his career as an inspirational bridge between past triumphs and future dreams. Stankard holds an honorary Muskingum Doctor of Fine Arts degree. A highly acclaimed American glass artist, it is interesting to note that Stankard experienced poor academic performance as a result of an undiagnosed learning disability. However, his creativity along with a spiritual mindset and love of nature allowed him to reach his full potential in life. Paul Stankard’s work is represented in more than 70 museums worldwide. A pioneer in the studio-glass movement, Stankard is known for interpreting native flowers in small scale glass sculptures. His work explores and interprets color, texture and delicacy while continuing to examine and celebrate the fecundity of the plant kingdom. A resident of Mantua, New Jersey, Stankard is the Artist in Residence and Lecturer at Salem Community College, inspiring students to search for their individual creative spirits. Stankard was recently recognized as Master of the Medium by the James Renwick Alliance affiliated with the Renwick Gallery, Smithsonian Institute, Washington D.C. and was also awarded the Glass Art Society’s Lifetime Achievement Award. For more information about Paul Stankard, please visit www.paulstankard.com. Press Release note: Additional photos are available and interviews can be arranged by calling Jane Kaplan, 847.433.8594 or via email, jane@JKaplanCommunications.com.